It looks like Boracay’s reopening is going to be as chaotic as its closure six months ago. With just 18 days to the announced reopening, the travel trade is bemoaning unresolved issues, among which are how to implement the island’s newfound carrying capacity, the absence of an official advisory, and unfinished construction of the main and other roads. Jojo Clemente, president of the Tourism Congress of the Philippines (TCP), the only stakeholder to have been invited to the recent inter-agency committee meeting of the Departments of Tourism (DoT), Environment and Natural Resources (DENR), and the Interior and Local Government (DILG), expressed scepticism over the proposal to halve the existing number of hotel rooms. “There is no viable way to do that (as it will) restrain business and free enterprise. You cannot just arbitrarily do that”, Clemente said in response to DENR undersecretary Sherwin Rigor’s idea to reduce the island’s room count, based on 6,505 tourists a day, with the island’s carrying capacity capped at 19,000 tourists at any time. Questions also surround how tourist numbers would be tracked. Boracay’s road widening and the installation of drainage pipes are scheduled for completion in 2019 or early 2020. A travel consultant said it will be a “big embarrassment” as a number of resorts are along the main road and tourists would certainly be assaulted by mud, dust and drilling noise, apart from access and mobility problems. A leading travel consultant favoured delaying Boracay’s opening beyond October 26 to when it demonstrates readiness to welcome visitors. Photos of Boracay’s unfinished and muddy roads that went viral recently had turned off South Korean and German tourists and led to travel agencies losing confidence in marketing the island. Mary Ann Ong, general manager of Luxus Pacific Travel and Tours, bewailed the absence of clear and official guidelines. “One of them (in the inter-agency committee) has to take charge and come up with advisory… Put it in writing…so we can make plans”. While the water is clean and illegal structures have been removed, there are still no public toilets along the beach, a travel consultant said. A priority, she stressed, is to make available an adequate number of toilets with working flush. 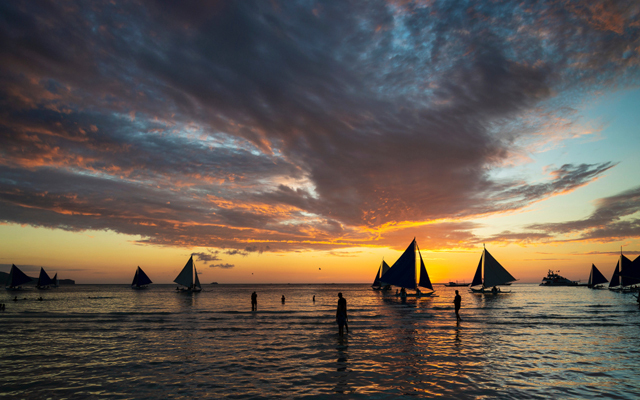 There is a cavalier attitude about rehabilitating Boracay, opined some tourism stakeholders, inflamed by the idea that the tourist island has been made a “guinea pig”. A travel consultant, from the start wary of plans to rehabilitate Boracay without proper planning and consultation with stakeholders, has not been accepting bookings to Boracay for fear that it won’t be ready by October 26. “Everything that we anticipate will happen is happening now,” he remarked. Aquino said that while Blue Horizons does not turn down bookings to Boracay, the company has been very careful in stating the island’s status and stressing that it cannot be held accountable, especially critical for certain source markets in Europe that are “very serious about consumer laws”. Travellers get instant compensation over complaints and they will get back at the travel agency, she added.